With just a solitary galloper in work at present, Nowra horse breaker and pre-trainer Richard Butler has already displayed the nouse to take on the imposing records and numbers of the Danny Williams and Matthew Dunn stables in the TAB Highway series. Butler’s timing was perfect for his first city winner in April when $32,000 bargain buy Good Weather ($15) upset the high profile stables to win at Warwick Farm. Butler, 38, who learned his craft from schoolboy days with the renowned Robinson Shoalhaven racing family, has the confidence in rank outsider Fruitful Warrior to jump from a modest Nowra Maiden win recently, into a Class 2 TAB $60,000 1400m Highway at Rosehill Gardens on Saturday. “He’s the only one I’ve got in work, he’s immature but has ability and upside,” Butler said. “Good Weather is spelling and the others are at the pre-trainers. “It’s always a big ask to jump a grade from a maiden and you know anything that Danny Williams or Dunn brings to a Highway will be genuinely strong and set for it but we thought the timing was right. 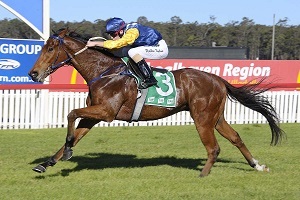 Fruitful Warrior (Robbie Dolan) broke his maiden on Nowra Cup Day. Credit: Bradley Photos. Fruitful Warrior (Choisir) sure will and at big odds. It’s rare for anything to come from rearward at tight and turning Nowra and Fruitful Warrior did it unextended to win by a widening 3.5 lengths carrying 57 kg and he drops to 54.5 kg on Saturday for in form Andrew Adkins. While Butler is under no illusions about the sharp rise in grade and the opposition, he considers he has factors in his favour. “Dropping in weight will help him finish if we get a strong tempo and that’s usually the case in these Highways,” he said. Butler is a career horseman who started with the late great Kevin Robinson as a 12- year-old working at the stables after school and at week-ends. Meanwhile Dunn has accepted with promising Cinnamon Missile and Doctor On Ice, and Williams with Hemmerle. James McDonald, amidst a brilliant return to riding, has been booked for top-weight Radiant Choice who is coming off a highly impressive win at Tamworth, and was competitive in town last preparation for rising young trainer Stirling Osland. Williams and Dunn have won the previous two Highway races and their success in the series is well into double figures apiece. View the fields, form and race replays for Saturday's Rosehill meeting here.